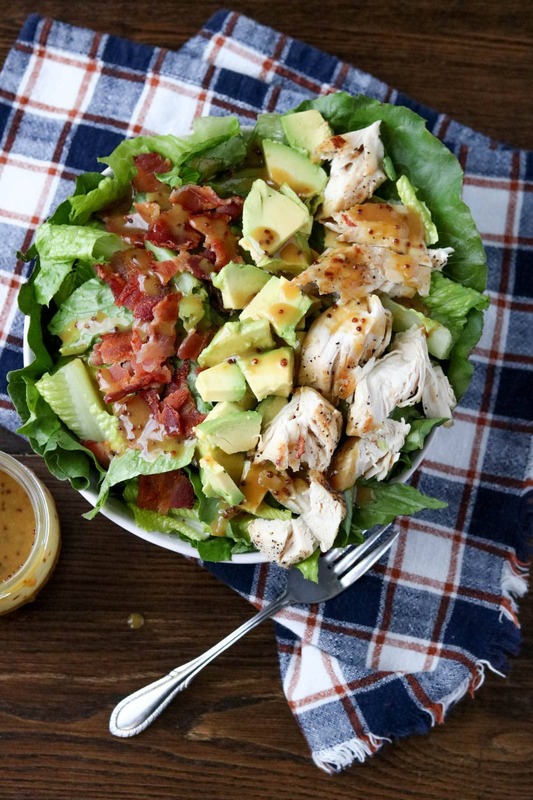 This chicken bacon honey mustard salad is high on flavor but low on sugars and unhealthy ingredients. I used to love eating honey mustard chicken salads at restaurants, but have you ever looked at the nutrition label for those? Most of the time they’re higher in calories than a burger and fries. Not to mention restaurant honey mustard dressing is usually chalked full of high fructose corn syrup, leaving the sugar gram content sky high! This chicken bacon honey mustard salad uses my favorite homemade honey mustard dressing. I probably make this dressing at least twice a month, it’s one of our favorite dressings/sauces to incorporate into meals. I threw on some fresh avocado for an additional healthy fat, but depending on your preference or macro count you can opt to leave this out. The bacon is my favorite nitrate-free bacon from Pederson’s Natural Farms. 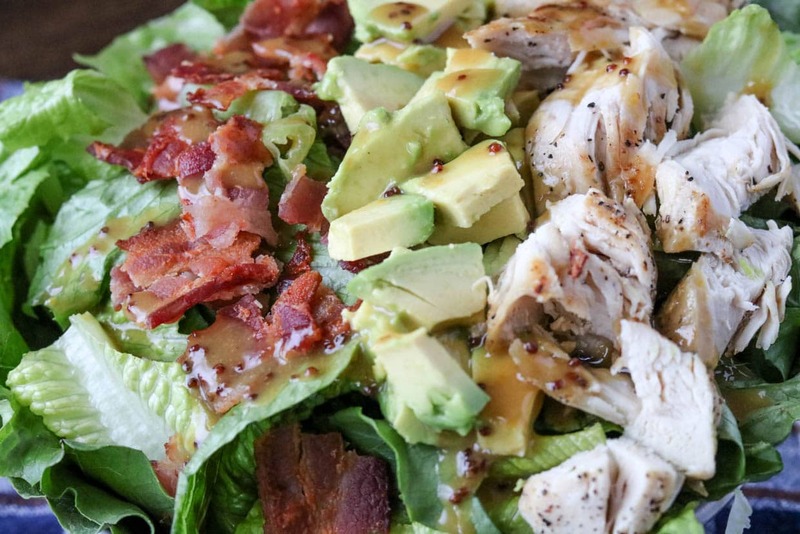 The grilled chicken adds another good protein addition, and it’s all laid out upon a bed of romaine lettuce. You can enjoy this salad bowl at home or pack it up and take it into work for a healthy lunch option. In a large skillet, cook the six slices of bacon, drain on a paper towel lined plate and set aside. In another large skillet, heat EVOO over medium-high heat. Season chicken tenders with salt and pepper and sauté until cooked through, turning once. Remove chicken from skillet and slice into smaller chunks. In a small mixing bowl, add dressing ingredients and whisk until combined. Store in refrigerator until ready to serve. Peel and pit the avocado, cutting the avocado into small chunks. 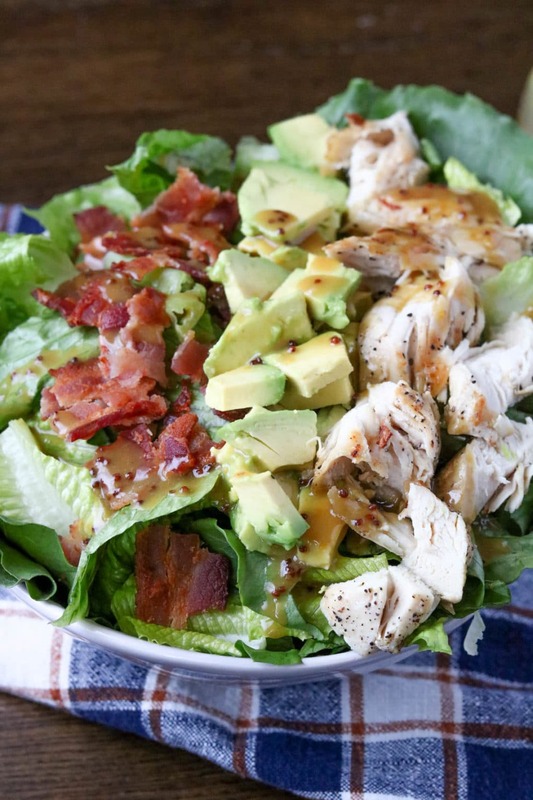 Cut the romaine lettuce into smaller pieces and add to a medium-sized individual salad bowl. Crumble 2-3 slices of bacon and add to salad. 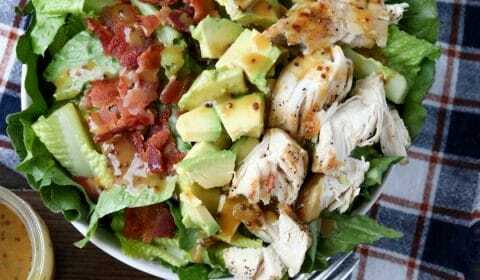 Add about half of the sliced avocado and 1/3 to half of the chicken to the salad.